Tayangban Cave Pool is one of the coolest experiences we had on Siargao! 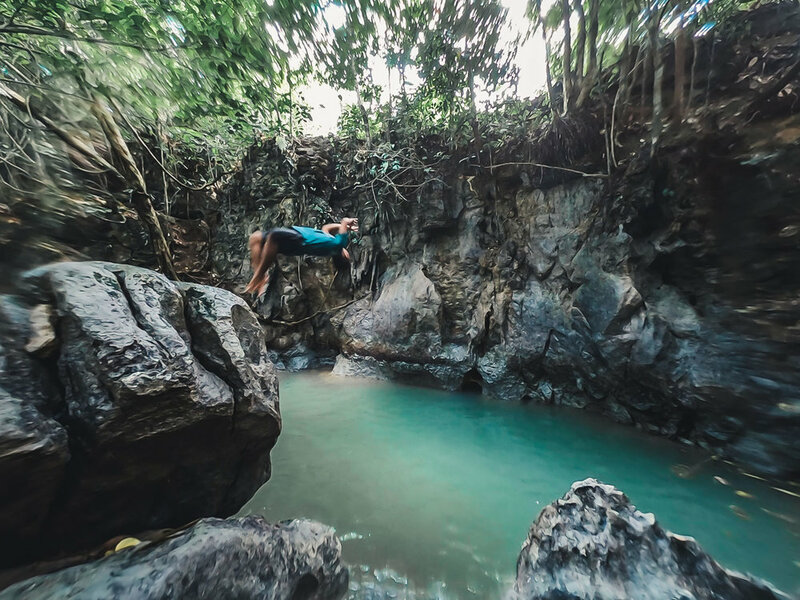 You’ll trek through a pitch black cave with rushing water and find yourself climbing out into an extremely blue pool that you can jump into. There is a small 3m jump and a secret 7m jump where you have to scale the wall next to the pool! The whole experience is fairly fast. The cave takes around 15 or 20 minutes and then you can spend a few minutes chilling and jumping at the pool, but I wouldn’t expect it to take more than 45 minutes end to end. The trek has you walking and swimming through water that gets up to chest height! The ground is not slippery at all but can be sharp in some places, so we’d recommend wearing good flip flops or water shoes if you have them. Tayangban Cave Pool is located around 30 minutes north of General Luna on the road to Pilar and the Magpupungko tidepools. 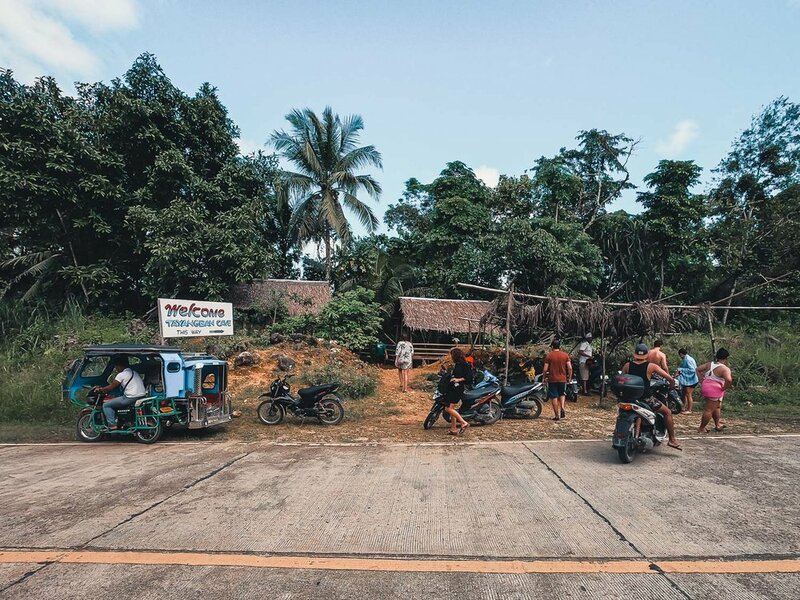 The best way to get there is to rent a scooter which can be organized by your accommodation and should run you P350-P500 per day not including gas. You’ll get a cheaper rate if you rent for 3 days or more. You can also hire a tricycle driver, rent a van to drive yourself for P2500 per day, or book a land tour for around P1500 which will include a visit to the Magpupungko tide pools and the insta-famous swing at the Maasin bridge. Visiting the cave requires a guide. The guide fee is P100 and the entrance is P70 per person. Tipping is appreciated but not required. Tayangban Cave Pool is open until 5pm, but you can likely go as long as there are guides available at the entrance. We’d recommend giving yourself a little bit of time so you can enjoy the cave and pool while it’s light out!